My current favorite spatula for scraping things out of a Vitamix container is the iSi slim spatula. It’s just the right size, shape, and stiffness to cleanly scrape blends out efficiently. I’ve previously been a big fan of the nylon spatulas that Vitamix sells. The slightly soft edge of a silicone spatula can scrape things out slightly more efficiently, but, until using the iSi slim spatula, the silicone spatulas I tried did not work well with the shape of the Vitamix container and blades. The iSi slim spatula is the perfect width to scrape out the very bottom around and under the blades. I use the same technique that I developed with the nylon spatulas: I put the wide part of the spatula against the dull side of the blade and then push against the blade to rotate around the bottom and scrape the very bottom of the container. By hitting the dull side of the blades, the spatula is holding up well, with no noticeable cuts or cracks after 4 months of steady use. I use the 32-oz container for thick mixtures most frequently, so that’s the container that I have the most experience using spatulas with. I have tested this spatula with all of the other containers as well. 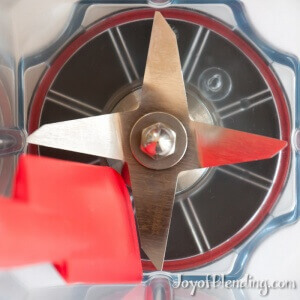 It works best with containers with 3″ blades, which are the 32-oz, the 48-oz, and the tall 64-oz containers. It is not quite the optimum width for the wide G-Series container or the S-Series. An ideal spatula for the wide G-Series container would be slightly wider, which would allow it to scrape the bottom more efficiently. (The narrower width of the iSi slim spatula requires two passes around the bottom of the wide containers.) And it is not perfectly shaped for the smaller S-Series container—for that one, I prefer the classic nylon Vitamix spatulas which have a rounded end. Update: Vitamix released a new blade scraper, and I find that it works well in the wide, low-profile, 64-oz containers, but for the narrow containers, I still prefer the iSi slim spatula. Long enough to reach down to the bottom of a Vitamix container. Soft enough to make a good seal, but rigid enough that it can scrape out thick and sticky blends like hummus and nut butter. Single sealed piece of silicone, which means you don’t have to worry about moisture and bits of food getting stuck in a crevice between multiple parts. Long straight edge scrapes sides faster than spatulas with a shorter head. These features make it the best Vitamix spatula that I’ve used thus far. I do not like the silicone spatula that Vitamix sells nearly as much, and I actually prefer the nylon spatulas to that one. I found the small end to be too small, and the large end to be slightly too large. Also, it is not quite straight enough to perfectly scrape the flat sides. And, the overall build quality just doesn’t feel quite as nice. If you already have the Vitamix nylon spatulas I wouldn’t say you need upgrade to the slim iSi, but if you are ever frustrated by not being able to get every last bit out of the container, then I’d say go for it; it’s currently pretty cheap on Amazon. One other trick to keep in mind is that if you make something that sticks to the container, sometimes the easiest option is to not worry about scraping it all out, and then to make a “clean-out” smoothie or soup. A bit of nut butter residue goes great in most smoothies, and a quick savory soup goes well with hummus leftovers. 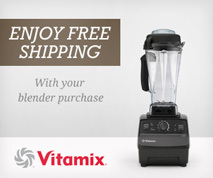 I came by your website by default and I love it and haven’t received my Vitamix yet!! I’m soooo excited to get started on my recipes. Thank you so much for this site! Very useful post. Thank you for taking the time. I was curious how this spatula has held up over time. Is it still in one piece? Has it picked up any odors? Thank you! Still in one piece, and hasn’t picked up any odors. It has a slight scent of it’s own (similar to some other silicone implements), but I’ve never noticed it transfer that scent to food. I am making cashew nut cheese and have a problem with getting the mixture out from under the blades. Would this spatula work for that and nut betterseliz? I have the 64oz. model no. 5200. So I will see if bed bath and beyond has the correct spatula. Thank you for your reply. My Vitamix came with a spatula but I’m not a huge fan of it ? I have a Pyrex one that I love, squishy enough to get most of the blend out ?